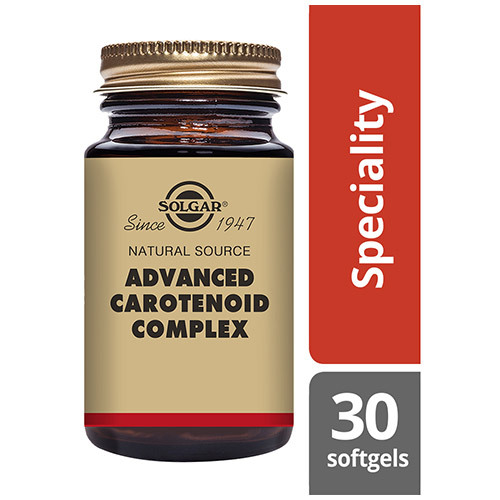 Solgar® Natural Source Advanced Carotenoid Complex provides alpha-carotene, beta-carotene and other carotenoids. Free radicals are produced by the body when you breathe, digest food, exercise or even sleep. They are naturally occurring as they are created by emotional stress, ultraviolet light, radiation and air pollution. Free radicals damage the body by causing deterioration of the cells, lower the defences against diseases and putting the body into a ‘stress’ state. 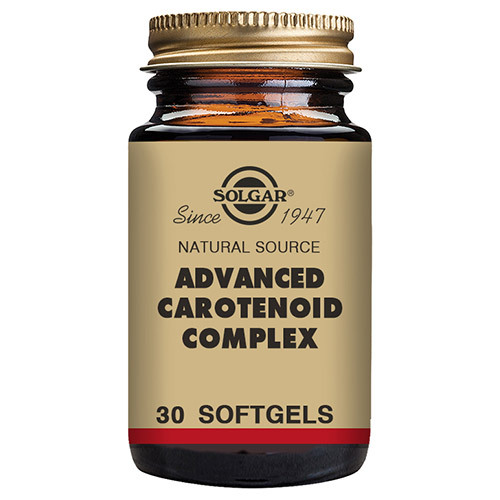 Solgar® Natural Source Advanced Carotenoid Complex provides Alpha-carotene, Beta-carotene and other carotenoids, such as Zeaxanthin and Lutein.. This formula also contains natural Vitamin E (d-alpha tocopherol) which in studies has shown to be 1.3 times more bioavailable than synthetic forms**, as well as Soy Lecithin, which is extracted from highest quality soy beans available and provided a natural source of this important ingredient needed by every single living cell in the body. One softgel a day could help your cells fight the damage caused by free radicals due to exposure to ultraviolet light and deterioration of cells. Safflower Oil, Softgel Capsule Shell (gelatin, vegetable glycerin), Thickener: yellow beeswx, Mixed Carotenoids (as prep. 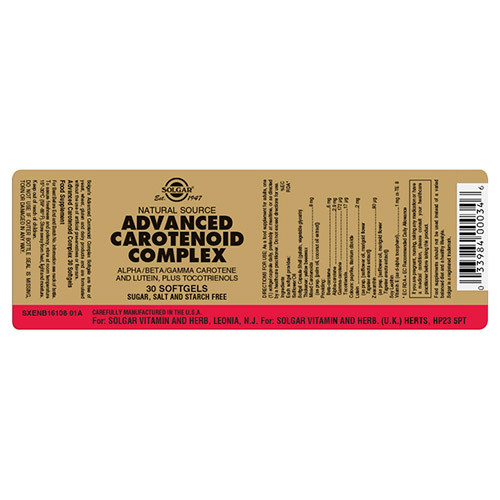 [palm oil, coconut oil extract]), Beta-carotene, Alpha-carotene, Gamma-carotene, Tocotrienols, Colours: paprika, titanium dioxide, Lutein (as prep. [safflower oil, marigold flower, Tagetes erecta extract])m Zeaxanthin (as prep. [safflower oil, marigold flower, Tagetes erecta extract]), Soy Lecithin, Vitamin E (as d-alpha tocopherol). To assure freshness and potency, store at room temperature 15°-30°C (59°-86°F). 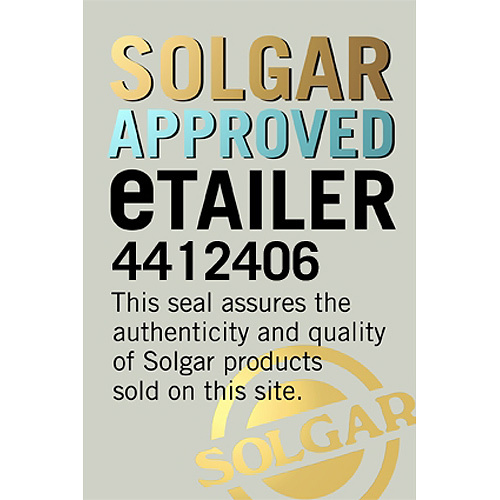 Do not use is outer bottle seal is missing, torn or damaged in any way. 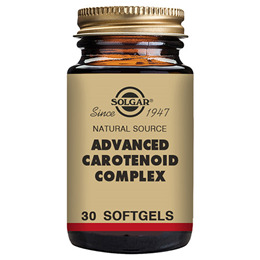 Below are reviews of Solgar Advanced Carotenoid Complex - 30 Softgels by bodykind customers. If you have tried this product we'd love to hear what you think so please leave a review.